These Pole Mounting Brackets are for Custom Banners! Each Lamppost Hardware Kit is Sold in Multiple Sizes! Buy Pole Mounting Brackets Today! Screw gear bandings are 40" long to fit around most lampposts. Wind tunnel test shows reduce 87% reduction of wind load. Zip ties and pins secure the banner to the bracket. Pole mounting brackets are constructed of cast aluminum for durability. These pole mounting brackets include everything except the custom banner and post. 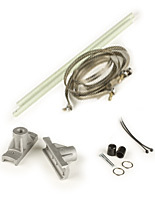 This flag hardware kit comes with (2) fiberglass rods, (2) brackets, (6) bandings, (2) pins, (2) zip ties, & instructions for installing. 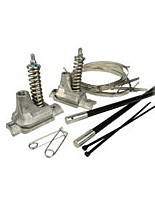 These banner accessories are pole mounting brackets that will not rust since they are made of cast aluminum. 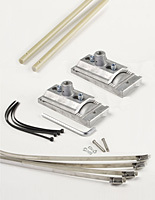 The durable construction of this street flag hardware set will last years of use. These pole mounting brackets, known as flag hangers, have 40" long bandings which will fit on standard posts up to 12.75" in diameter. Street banner hardware is easy to install. These pole mounting brackets for (1) banner and are designed for use outside on lampposts. Each banner hardware kit can hold one 24"w street flag. These banner hangers are pole mounting brackets that are wind tunnel tested to reduce the wind load up to 87%. The test results are below so buyers can be rest assured that the street flag will be sure on the lamppost even in strong wind gusts. 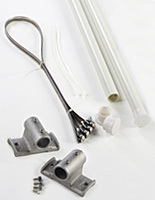 These flag accessories are pole mounting brackets that are inexpensive. The main reason the cost of these are so low is that they do not have the feature for "on-pole adjusting". Customers can adjust these on the poles, however all the bandings will have to be loosened and retightened once in the desired location. Pole mounting brackets are popular on college campuses, downtown areas, outdoor strip malls, and large parking lots at hospitals and entertainment venues. Hanging a custom flag on lampposts is a great form of marketing since they are above ground level, patrons can't miss them whether they are walking or driving past. Pole mounting brackets are heavy duty for long term use. Banners can easily be switched out for different events or with the change of seasons, consumers will just need to provide new zip ties which can be purchased at most local hardware stores.